A low temperature dehumidifier? What is it? A low temperature dehumidifier is a dehumidifier which can do its job in low ambient temperatures. But what does low temperature mean when we are talking about these appliances? If you were walking your dog on the beach one Sunday evening, wearing a short sleeve shirt and shorts, enjoying a light sea breeze and savoring the slightly cooler 65°F evening temperature, providing some welcome relief after the heat of the day, you might be surprised if another walker hurried by muttering, "I must get home before I freeze". Some of you may be equally surprised to learn that anything below 65°F (18°C) is "low temperature" for a dehumidifier or, more specifically, for any refrigerant model. What do I mean by refrigerant? It's the type bought every day for use in the home. It could be a Frigidaire portable or a Santa Fe basement unit. They both work on the same principle but only one is a low temperature dehumidifier, as we shall see. A refrigerant model removes moisture from the air by condensing water vapor on a cold coil. The coil is cooled by a refrigeration system, hence the term "refrigerant”. This process will result in the formation of ice on the cold coil in ambient temperatures as high as 70°F and ice on the coil will both degrade performance and, if not removed, damage the appliance. For this reason most refrigerant models have an "auto-defrost" function. A sensor detects the formation of ice and the compressor, the refrigeration "engine", shuts down. The fan keeps running and the flow of air gradually melts the ice. Once the ice has gone the compressor restarts and the water extraction process continues. The problem is that the lower the temperature the longer the defrosting time. The longer the defrosting time the shorter the water extracting time so, as the temperature falls, the dehumidifier becomes less effective although it continues to operate and will not be damaged even in ambient temperatures only a few degrees above freezing point. This explains how a model which is rated by the manufacturer for operation in temperatures as low as 41°F (5°C) can also be described in the user's manual as "unsuitable for use in ambient temperatures below 65°F". This is not a problem in those parts of the world where in the "cool" season temperatures drop to the mid 70's. For those of us who live in cooler climates, and as kids in winter used to wear three pairs of socks in bed, the problem is very real. If we have an unheated basement, crawl space, garage, workshop or boat an appliance that is "unsuitable" for use below 65°F will not be on our shopping list. We need a low temperature dehumidifier. Basements and crawl spaces are reasonably well provided for. Models designed for use in a basement or crawl space are available from Therma-Stor (Santa Fe) and Basement Systems (the SaniDry range). All of these units are designed to commercial standards and are fully effective at temperatures down to 55°F (13°C) or less and will perform at lower temperatures, although with decreasing effectiveness. Garages, workshops and boats located in very cold areas present more of a problem. These locations may be only a few degrees warmer inside than the outside air and most of the available solutions are expensive. Desiccant dehumidifiers will operate effectively at temperatures just a degree or two above freezing point. A desiccant unit of sufficient power to control humidity in spaces of this size has a fan to draw in and expel air and a slowly rotating wheel, largely made up of desiccant material, to absorb the water. 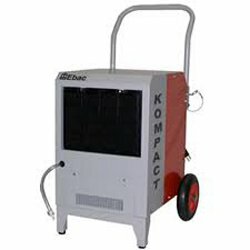 Portable desiccant models are widely available in Europe at prices comparable to refrigerant units and are effective low temperature appliances suitable for use in garages and boats. This type is not widely available in North America and when they can be found are typically at least twice as expensive as they are in Europe. Desiccant units designed for commercial and industrial applications are available on both sides of the Atlantic but are much more costly. Unlike portable desiccant models they do not collect liquid water but vent it as vapor in a stream of warm air, via ducting, to the outside. Refrigerant dehumidifiers with "hot gas defrost" are also effective at temperatures approaching freezing. The best of these are the Mitsubishi Electric MJ-E16V and MJ-E16VX. These too are readily available in Europe but scarce and expensive in North America. Once again the only alternative is an even more expensive commercial unit. If you are unable to obtain a suitable low temperature dehumidifier the only alternative is to heat the space where humidity is to be controlled. Heating reduces relative humidity because warmer air "holds" more water than cooler air. This by itself may be sufficient to prevent condensation but, if not, will create conditions in which a typical portable model will be effective. This too may be an expensive option and it appears that there is a gap in the North American market for a reliable, effective and competitively priced low temperature dehumidifier. Low temperature dehumidifiers are not needed by the majority of US residents and those that are available are designed as crawl space or basement dehumidifiers. 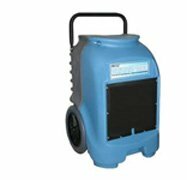 No US distributor of portable dehumidifiers has yet seen fit to market a true, low temperature model for use in and around the home, or in a vehicle. To work at temperatures just above freezing you need one of two types of appliance; a refrigerant unit with "hot gas defrost" or a desiccant unit. The good news is that there are refrigerant models available in the USA with hot gas defrost. The bad news is that they are made for commercial and industrial use and are substantially more expensive than a portable, by a factor of two, three or even more. If the idea of spending this amount of money is unacceptable you may not wish to continue reading this page. If, however, your need is to protect something of such value or importance that you will pay a much higher price to do so, there are links for you to follow to detailed reviews of each model I will introduce. Industrial desiccant models are also available in the USA but are substantially more expensive, from around $2000 upward. The refrigerant models which are mentioned below are perfectly adequate for home use and I would not suggest that anyone should consider using one of the specialized, desiccant type unless they have items of great value stored in a location where temperatures fall below freezing. For a small space, such as a garage, a boat or an RV the most suitable model available is the Ebac CD30. This unit is very compact, just 12 x 22 x 12 inches, and weighs 50lb. Although the water extraction rate is only 17 pints per day this unit will be effective in an area of up to 400 square feet. For a larger area, but where a compact dehumidifier is still required, I suggest the Ebac CS60. This low temperature dehumidifier measures 14 x 29 x 14 inches and weighs 63lb. It will extract up to 56 pints of water per day and will control humidity in an area of up to 1500 square feet. Since this page was first published, a new dehumidifier has appeared on the US market with hot gas defrost. Falling between the Ebac CD30 and the Ebac CS60 is the Oasis Dehumidifier Model D165HG. This unit has a water extraction capacity of 35 pints per day and is significantly less expensive than either of the two Ebac Models. It is a welcome addition to the range of low temperature dehumidifiers in the USA. For cool basements a basement dehumidifier, such as the Santa Fe Classic will be entirely suitable but, if your basement temperature remains just a degree or two above freezing for any length of time you may consider a water damage restoration dehumidifier such as the DriEaz Drizair 1200 64 pint dehumidifier. DriEaz refers to "hot gas bypass" to describe the hot gas defrost feature of this low temperature dehumidifier. Please let me emphasise that these dehumidifiers are all expensive. I am not encouraging you to invest in any one of them unless you believe that it suits your needs and priorities. All of the links above take you to other pages on this site, not to the sites of merchants selling these products. If you should decide to purchase one of these models, however, the initial outlay will be offset by the longer life expectancy of these dehumidifiers. 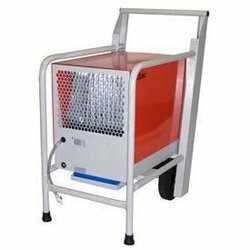 Low temperature dehumidifiers are built for use in tough industrial and commercial applications and are manufactured to much higher standards than portable models for domestic use.